When I looked at my schedule for the ALA Annual Conference, I felt like I needed to borrow Hermione Granger’s Time-turner. So many great sessions to go to, and they were happening at the same time. But one that I really made sure I got to was one that wasn’t even on the official list of sessions. It was held in the “Uncommons,” a big room just outside the exhibit hall. This session was Guerrilla Storytime, put together by some smart young librarians who seem to have met on Twitter. Because I am somewhat of a Twitter addict, I knew all about it. My non-tweeting librarian pals had not heard of it. I tried to convince them how awesome it would be, but they had other things to do. Not me, I wanted to hang with this vivacious gang of young whippersnappers. Now, I’m not ancient, but I have been around libraries for a long time. Degreed in 1996 and working in libraries for at least 3 years before that, I’ve done my share of storytimes. The ideas that are shared on Twitter, Facebook, Pinterest, Flannel Fridays, and blogs by these younger librarians are so incredibly inspiring. So inspiring that I am now doing storytime again once a month, just to try out some of these amazing early literacy techniques that have evolved in the past few years. These folks have great ideas and they bounce them around off one another and share and borrow and expand and make the World of Storytime one of the most awesome places on the planet. As a seasoned librarian, I am amazed and excited on a regular basis by these Early Literacy Warriors. Storytime Guerrillas unite! Next time I go to a local conference, you can bet I’ll be taking over a space for my own version of Guerrilla Storytime. I might even have to rent a gorilla suit for the occasion. What is this all about? How did it start? What exactly IS a Guerrilla Storytime and why does it matter? I think I’ll let Amy, a Joint Chief, fill you in on that. Thanks for that introduction, Angela! The idea for Guerrilla Storytime was born of librarian Cory Eckert, idea-genius, in response to a whole bunch of factors. One factor: the discussion online over the past year about youth librarians not getting proper recognition for their hard, specialized work. Too many of our libraryland colleagues don’t quite “get” what goes on at storytime, and if they don’t recognize the vital service storytime provides, they’ll never be able to advocate for it to the families we need to serve. A second factor: storytime practitioners the world over are bona fide experts at what they do. We’re all experts, but we don’t all know everything, so it follows that we have lots we can learn from one another. Thus Guerrilla Storytime. Guerrilla Storytime is a public forum of sorts at which storytime librarians can ask questions and seek advice of their peers, and the collective community steps up to share their expertise. A librarian may not be well versed in parachute songs and asks for storytime guerrillas’ favorite go-tos; those guerrillas oblige, sharing what works for them and why. Along with all of the learning (and fun!) that naturally follows, Guerrilla Storytime raises professional awareness for the very real, very important contributions that youth librarians bring to their libraries. Since it takes place in a public space, Guerrilla Storytime has a way of drawing attention to itself and its participants; after all, if you heard a group of people shouting about “going bananas,” wouldn’t you stop to see what was going on? Happily, Guerrilla Storytime was not a one-off event at ALA. In fact, it’s developed into a larger movement, the Storytime Underground. The Storytime Underground website aims to be a resource for all those best practices, all those tips and tricks that you can forget over time. Participants will be able to pose their storytime questions using the Ask a Storytime Ninja feature; to get details on hosting a Guerrilla Storytime, then add their own Guerrilla Storytimes to the master calendar; and to learn from colleagues across the world through Storytime Guerrilla of the Month profiles and links to amazing online content in the Armory of Awesome. 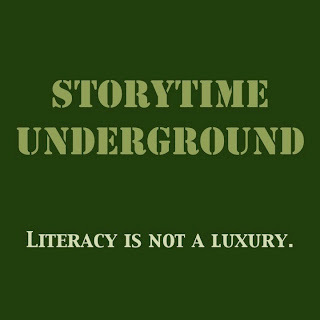 Just as Little eLit aims to be a go-to site for librarians interested in new media with children, the Storytime Underground aims to be a grassroots effort to share the storytime love and skills. Posted on July 24, 2013, in conferences and tagged #ala2013, Angela Reynolds, guerrilla storytime. Bookmark the permalink. 1 Comment.